Why Should you Optimize your Site for Mobile Devices? The trend of using mobile devices to search for content online is steadily on the rise, and gaining momentum. And tablets really seem to be advancing the cause, since more and more people are buying and using them. So how are these evolving trends changing things, and how does it effect you as a website owner? The focus is now centering more towards responsiveness and adaptability, which means that more content needs to made and optimized for mobile devices. In the last quarter of the year 2012, almost as much as 11% of the internet users were using mobile devices, more than 6% of which came from smartphones whereas less than 5% came from tablet devices. 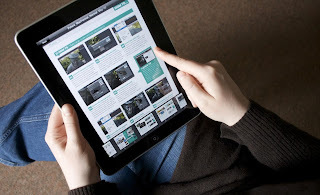 And although tablet devices nowadays have a computational power comparable to desktop devices (well, so do smartphones, but screen size matters a lot here), users still want the content optimized and rendered specifically for tablet devices. Hence, in a way, smartphones and tablets can be treated in a similar way. But what about now? According to a study, from the first quarter of 2012 to now, mobile internet usage has gone up by a staggering 26%, whereas tablet usage has grown by 19%, both very impressive figures in themselves. Desktop figures, however have taken a beating, with a decline of 6%. This, considering the size of desktop users, is a large decrease. but then again, who has the time to start up a computer everytime they need to Google something, right? These stats indicate that it is probably time to give more thought into optimizing your website, and aligning it more towards mobile devices. Here are a couple posts we have written that should help you out. Nice post , Optimize doesn't seems to be hard , but monetizing the mobile traffic is ..
Tablets are like small PCs..am just wondering are there blogger templates that are responsive..if one can change the template to be responsive. How to optimize web sites for mobile devices?? Well written.Thanks for taking time to write this..
Really a nice post,not seems to be much difficult.Thanks fpr sharing. Nice Information This is very Good way to get more visitors and thanks for sharing this helpful post. It's almost mandatory for every Bloggers to optimize their site for Mobile Devices. Nice one bro. Blogger Tips & Tricks | Make Money Online Blogging. I think in near future there will be no need to optimize website for mobile devices as modern mobile devices has resolution more than 1024px which is the base resolution of any website. Nice post about mobile version templates looks. Every one should have customize his/her template for mobile version because sometime we may also get visitors from such devices. You don't blog for Google ! How to display Adsense ads on mobiles? Being a pro blogger, you should at least remember that you shouldn't forget the ladder of success. Keep us updated with some awesome content and please post something new. I am (and surely many are) fed up with MBT!!!! Good post, again, its useful and i had already started to work on mobile Templeton optimizations as well. Hello my friend QASIM how are you? really it's the best of article and I like it keep in touch from INDONESIA. yes now it is very important . If you don't then you lost a huge amount of traffic . I already have the mobile version of the blog. There are some other way to mobilize... like Nokia OVI Applications, Android/window phone applications of blog can be made easily. sounds good, i too have a mobile template applied to my blog, i didn't make much effort for simply i found my perfect thing at http://www.adsurf.net check it out! but it's not free though! The article is well narrated I enjoyed reading the post. Yes, the question strikes most of our mind is why to optimize sites for mobile devices. Hope this would give an idea about it. As mobile application development is one of the top most leading industry today, it is very essential to build our site mobile friendly. People are using smartphone devices for searching through internet rather than laptop or desktops. Mobile is handy to take with you anywhere and a biggest reason in increase of mobile internet users. The increase in mobile internet users increases the demand of optimization of a website for Mobile Devices too. All credit goes to mobile app development companies who have launched several mobile applications already that increases the usability of mobile.